I'm a big fan of sleeping in on Saturdays. After the first week of youth programming, Saturday really would have been a perfect morning to catch up on some extra sleep, right? We all tend to want to hit the snooze button a few times on weekends (cursing the fact that we had to set an alarm at all), eventually force ourselves to get up, and spend the next few hours trying very, very hard to push the bitter "I could be asleep right now" thoughts out of our heads. Well, if Saturday morning began that way, it certainly didn't last long. As Tom, Annie, and I pulled up to Winthrop Beach to help the Friends of Belle Isle Marsh and Speaker of the House Robert DeLeo with the morning's beach clean up, I was reminded how great the Winthrop Beach community is and how honored I was to get to spend a morning with them! We couldn't have asked for better weather for Winthrop's first "Better Beaches" event of the summer. Bill Fuchs and his team from DCR handed out gloves, trash grabbers, rakes, and trash bags while folks caught up with old friends-- and met new Winthrop neighbors and visitors, too! Before we headed down to the sand, Speaker Robert A. DeLeo spoke to the crowd about the importance of preserving such a great resource like Winthrop Beach-- and all of our beaches around the Harbor. 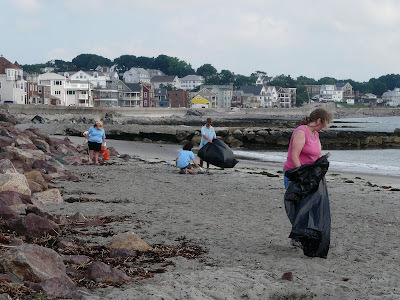 The stretch of Winthrop Beach that we were cleaning, he said, was just a small section of our Harbor's beaches; but when conscious citizens care about keeping our beaches clean and accessible to our region's residents, it's all going to add up. And that morning, Winthrop was definitely doing their part. As the clean up wrapped up, our friends at Winthrop Arts Association hosted their 4th Annual Artists on the Beach event, bringing local artists to the water to paint beautiful Winthrop scenes. When the Friends of Belle Isle Marsh and the Winthrop Arts association first applied for a Better Beaches grant through Save the Harbor, they wanted to push the creativity of traditional kids and family events and incorporate the arts into a innovative new way to bring people to the beach. Thus, Artists on the Beach was born! It really was a great morning in Winthrop. I always say that we at Save the Harbor get to work with the coolest, most passionate people around the Harbor, and never has that been better exemplified than by the group of people who gave their Saturday morning to improve their beach, be it by trash grabber or paintbrush. Needless to say, I drove away from Winthrop Beach on Saturday morning thinking, "Wow... I could have slept through all of that... and I'm really glad I didn't." So I hope you will ask yourself next Saturday morning (or any morning! ): "What can I do to help my beach today?" It could be picking up some litter along the shore, or it could be as simple as bringing someone new to the water to share our beautiful natural resource with more of Massachusetts's residents and visitors. I promise you, it'll be worth setting your alarm on a weekend.